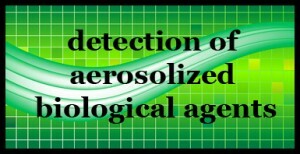 “Air, surface sampling techniques used by US government effective in fighting bioterrorism” – microBEnet: the microbiology of the Built Environment network. The headline above is from an article that someone sent us a couple of months ago that I just got around to checking out. It refers to a paper entitled “Detection of the Urban Release of a Bacillus anthracis Simulant by Air Sampling” published in Biosecurity and Bioterrism which is a journal that I bet makes uplifting bedtime reading. As is often the case, I don’t think that the paper (which seems fine) justifies the headline. Nonetheless this topic (detection of aerosolized biological agents) is one that comes up over and over again in the study of the microbiology of the built environment. The paper concludes that we can in fact use existing air samplers to adequately detect the release of a biowarfare agent which is at least mildly encouraging.